Quuu suggests the best, relevant content and makes it easy to share across your social networks. With social media, we’ve all turned into Brian, asking aloud, “Why are you showing me this?” But unlike Brian, we have the power to turn away. Stories we don’t care about? Not gonna read ‘em. Sales pitches for goods we’ve never shown any interest in whatsoever? See ya. So, how do you reach an audience of Brians that can tune out whatever they damn well please? is a service that provides hand-curated content suggestions. Based on identified interests, Quuu suggests relevant content and enables you to share it via your Buffer or HubSpot accounts. It might sound counterintuitive to turn to automated content marketing when it’s robotic content forced in front of our eyes that ignites our rebellion, but this is where Quuu sets itself apart. Unlike a bot or other similar services, Quuu reviews every piece of content. And this extra step to ensure that you sharing high quality content of actual interest has the power to genuinely engage your audience. You must provide valuable content or you’re as good as invisible. Be genuine, build relationships, be yourself – all the understood rules of the game for growing a following (which are still worth holding onto) neglect one huge factor: time. It takes time to listen to people, understand what they care about and have meaningful interaction. Maintaining strong, personal connections with everyone, with all the other aspects of business and daily life to attend to, isn’t realistic without some help. 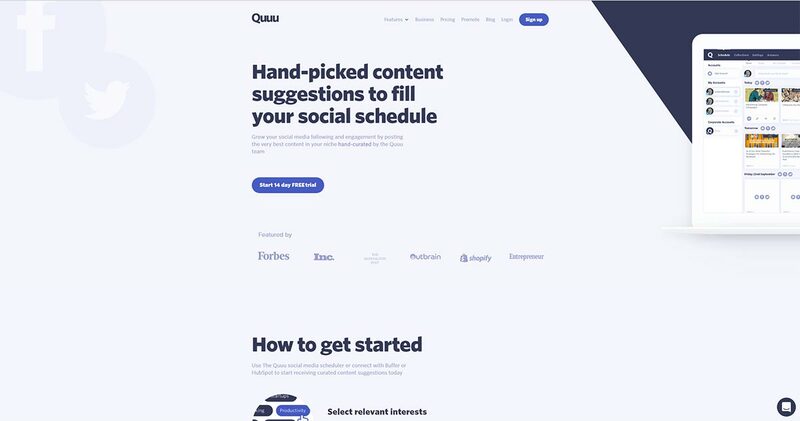 Quuu offers a solution that helps you respect the time and interests of others – and engage your audience better than you could on your own – while investing even less time in social media. takes sharing one step further by promoting content through influencers, real people with tremendous followings across Facebook, Twitter, LinkedIn and Google+. Want to keep Brian happy? Improve your social media game AND pass off the responsibilities? Learn more about Quuu or begin by setting up an account on the company’s website here.